4th of July, No No Nanette four times; Nine, twice, opening night of Raisin, the great late Tammy Grimes in Private Lives; Seussical; In the Heights and the first month of the revived-by-Encores! Chicago, before it moved to smaller houses. And now it houses, no--enshrines, Hamilton. my affection from Promises, Promises, oozing charm in a sleazy role. 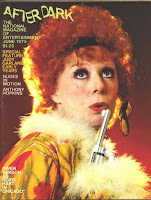 The show was so top-loaded I had little need to care for either Barney Martin or Mary McCarty--in another late career peak, following her Stella Deems in Follies, leading the ensemble in "Who's That Woman?" And should there be a moment of boredom there was always one or another of the lithe and eroticized dancers, male or female, to catch the eye. And perhaps most importantly it was Kander & Ebb at the top of their form, with melodies so engaging I couldn't wait to get the OCR on my turntable. This was also the summer A Chorus Line roared onto Bway from downtown, stealing most of the thunder (and a year later, the Tonys). And as much enthralled as I was with that show, too, I argued with my friends with unfounded certainty that ultimately Chicago would prove to have the more lasting score. The show was a soft hit (Gwen never had a musical flop) but it was far overshadowed by Michael Bennett's phenomenon, tho there was a publicity boost when Verdon had to exit for an injury, and was replaced for five weeks (just as Chorus Line was opening at the Shubert) by Liza Minnelli--starting a stampede for tickets. 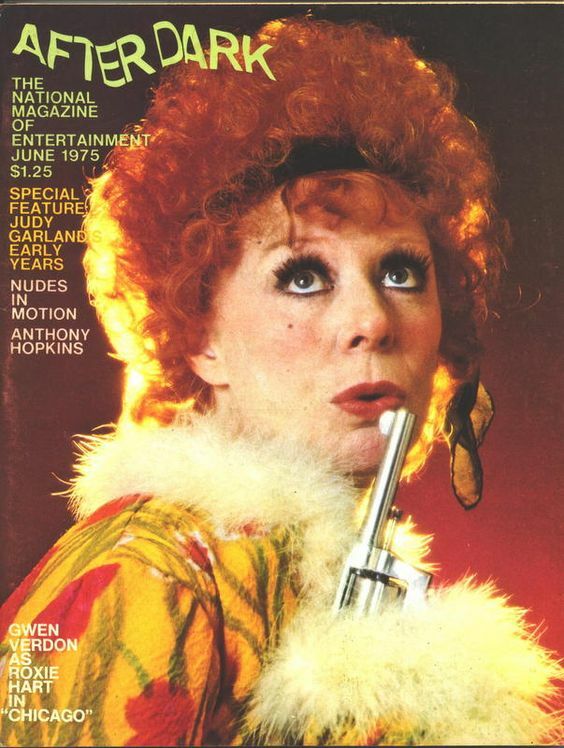 Verdon returned and stayed with the show until Ann Reinking took over for the final six months. A road company toured with obscure leads until Gwen & Chita stepped into it 7 months later during the obligatory Civic Light Opera weeks in LA & SF--where I saw the golden duo for a 4th and final time. Oh, yes, I had also seen it with Liza, who'd subbed on such short notice she was still a bit wobbly with the lines, but oh was she game--and yes she was an able Fosse dancer at the time. Despite all that, the show settled into semi-obscurity until 20 years later when Encores! 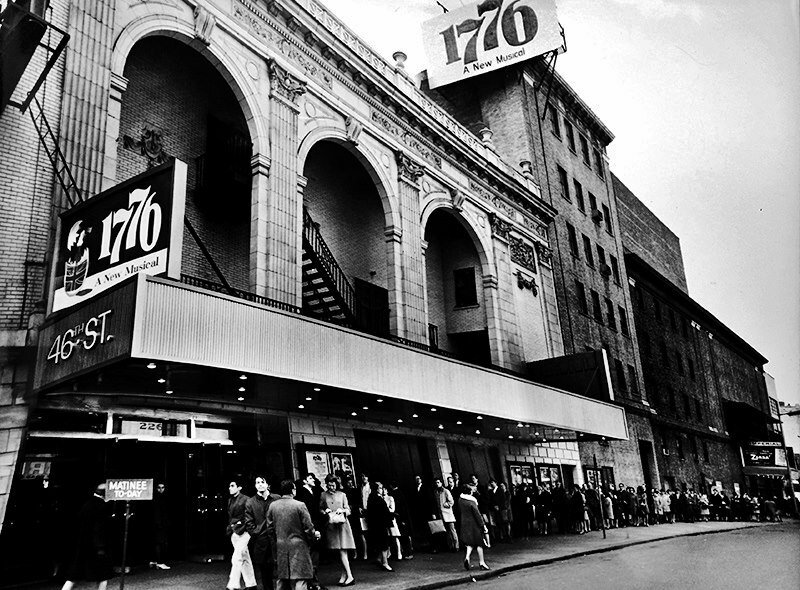 staged a stripped-down version that so electrified its audience it was quickly transferred to Bway--where it's now run over 20 years--the longest running American musical in Bway history. 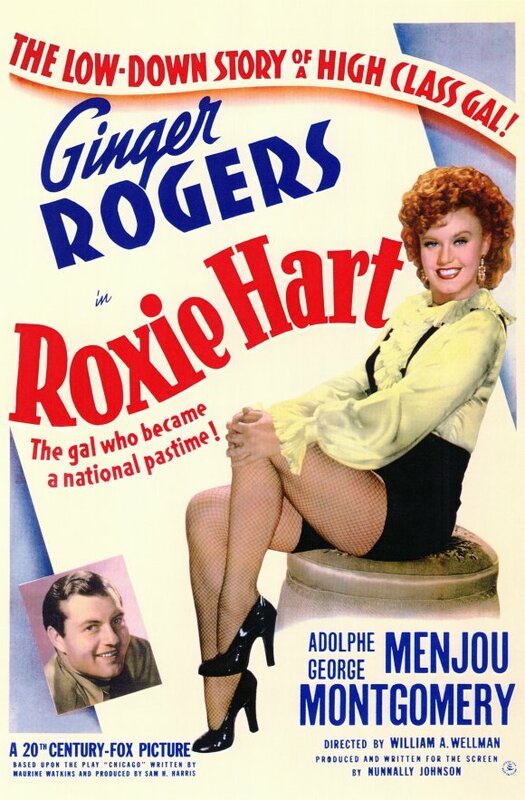 It was Gwen Verdon who first saw a musical in the 1942 Ginger Rogers movie, Roxie Hart; which in turn was a cleaned up, softened version of a play by Maurine Watkins--spun from her own reporting on two "Jazz-killer" trials in the Second City--a Bway hit in 1927 as Chicago. Watkins herself is quite worthy of fable; an Indiana girl gone Radcliffe, who impulsively decided to become a reporter and wound up interviewing a bounty of convicted murderers, including Leopold & Loeb. Just as abruptly she quit the trade, fearing she was enjoying it too much. While at Yale Drama School, she wrote Chicago and sold it to Sam Harris to produce--all by the age of 26. 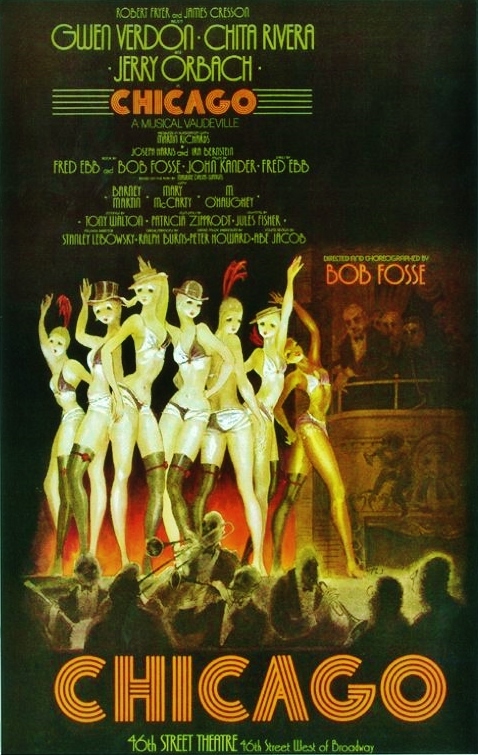 Fosse production was deemed too cynical by many--too cold to be enjoyable; a factor cited in its limited exposure. Aside from two years on Bway there was a national tour and a West End edition, but only one major international production in, of all places, Buenos Aires--and before even London. (Presumbaly Argentinos were more inclined to be cynical of society). Many cited the OJ Simpson trial as a turning point in American mores, which in turn gave new relevance to Chicago--as well as accrued theatrical value. And so a quarter century later at the instigation of Zadan & Meron, the Weinstein Bros. and Bway producer Marty Richards, the movie was finally a go. The screenplay was awarded to Bill Condon as a follow up to his Oscar-winning tinsel-town gargoyle, Gods & Monsters; and for director: Rob Marshall, whose film credits include Zadan & Meron's TV updates of Annie and the multi-racial Cinderella. Wise choices that trusted & preserved the show's inherent value, without trying to reinvent the film musical; in other words: without apology. 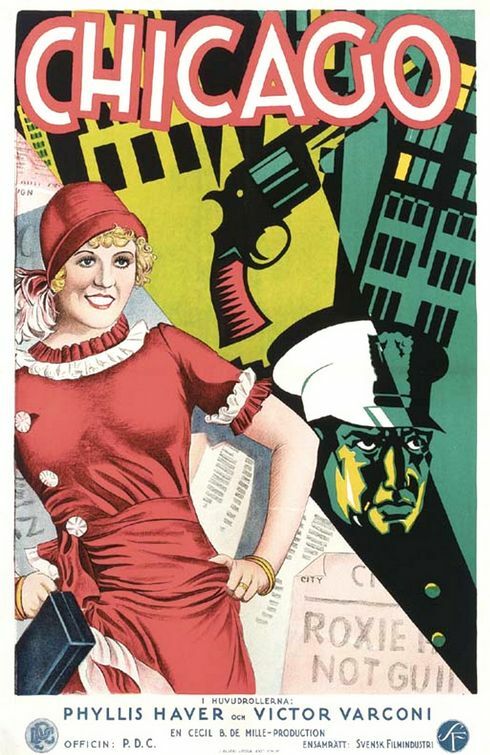 unlikely high society murderess who steals everyone's thunder at the climax of Roxie's trial. Taye Diggs tickles the ivories as a sort of silent emcee, doing little more than looking dapper in nightclub blue light. And Chita Rivera shows up--in a holding cell--for literally five seconds in her most hardboiled look & manner. 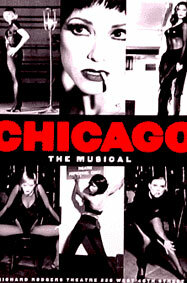 Twenty-seven years in the making, Chicago--the movie--opened Dec. 10th in NY & LA--my 50th birthday, as it were. But I was in SF and wouldn't see it until Dec 29th--two days after its national release. The film caught fire with the critics and public, and rode its year-end surprise to numerous citations, culminating in a hefty 13 Oscar nominations, including the Big One; Rob Marshall for directing and Bill Condon's script. Renee was put in the main actress category, and Catherine split into the supporting field, which also included Queen Latifah (as well as Meryl Streep, Julianne Moore and Kathy Bates). Richard Gere wasn't granted a nod, but John C. Reilly was. A half dozen technical categories yielded Oscars for Art Direction, Costumes, Film Editing and Sound. In a naked bid for gold, Kander & Ebb provided "I Move On" (supposedly a reject from the show) to play in the end credits. The Academy gave the Oscar instead to Eminem. There hadn't been a Bway musical movie in the Academy's top list since Cabaret--and no winning picture since Oliver! in 1968. It didn't seem like it would ever happen again. 2002 was a better than average year with some high profile competition including two epics: Martin Scorcese's Gangs of New York and Roman Polanski's masterpiece of the Warsaw ghetto, The Pianist. Others in the running were the second installment of the not-yet-Oscared Lord of the Rings trilogy (and by consensus the least worthy of the three); and a starry, literary prestige item from Michael Cunningham's book The Hours. Also rans that year included Adaptation, Frida, Catch Me If You Can, About Schmidt, Far From Heaven, and Almodovar's Talk to Her--which won original screenplay. The year before, Baz Luhrmann's psychadelic Moulin Rouge was the first musical to get a Best Pic nomination since All That Jazz. Both films played fast & loose with interpolated music, exaggerated style and fancy editing. But Moulin Rouge--tho hailed as the second coming of the musical--was more flash than substance, visually overpowering--but so shredded into snippets of film the eye can never take in the uber-Rococo spectacle with any satisfaction. 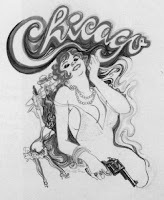 Fortunately, Chicago didn't pick up the habit, and tho it's certainly cut with more briskness than the old MGM model, it is artfully & carefully edited--earning Martin Walsh a well-deserved Oscar. 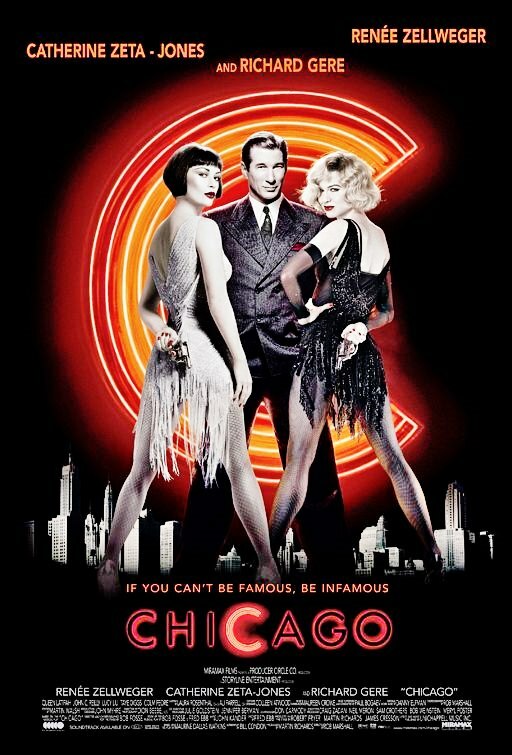 Like Cabaret 30 years prior, Chicago took an early defined lead in collecting statues, but lost script & direction to The Pianist--a victory against odds for Roman Polanski. The ultimate prize was in question until the final opening of the envelope. Understandably, Hlwd was more in the mood for a musical than another reminder of the world's horrors. And here was, at last, a musical that appealed to the masses without apologizing for its Bway mantle. A musical worthy of Oscar. The movie grossed $170 million domestically, for a $306 global total (21st century numbers are impossible to correlate with those of decades past--when Hlwd listed "rentals" deducting all payoffs for a more realistic studio profit figure. $300 million comes to a lot less when you pay out the theater chains, the advertising and other sundry costs.) 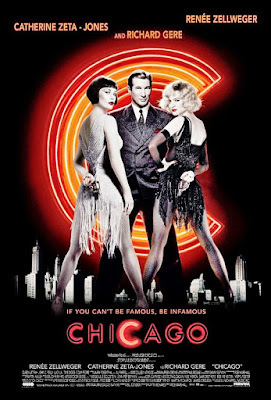 Still there's no disputing Chicago was a smash hit--the highest grossing movie musical ever--for the moment. The gates once again open, Hlwd took a look at Bway with fresh eyes. Bway itself was reawakening; moving from a Bronze Age (after the usual 28-30 year span--yes, the Saturn return cycle) into a brighter, more Silver Age, if you will, where the Bway musical rose above the narrow margins of popularity it fell to post-Golden Age; to a somewhat unapologetic acceptance, even some degree of cool. In large measure this was due to bringing back the comedy in Musical Comedy--something that became scarce in the wake of Sondheim and the Brits--undoubtedly a factor in the shrinking audience. But Bway was bouncing back at the Turn of the Century--something, I confess I never expected to see in my lifetime. Times Square had been transformed from its trashy & dangerous nadir in the '70s. The once low-rise theater district had been engulfed in canyons of skyscrapers; the TKTS booth in Duffy Square evolved into a stadium for gawkers; the neon homeland giving way to massive hi-def TV screens; traffic-clogged streets reduced to massive pedestrian malls; one big showgoer's Disneyland. Only unlike previous eras, musicals were now 90% of all shows on Bway. Whether driven by politics or history the Zeitgeist demanded it. As the Golden Age once bloomed in the anxious soil of horrific war, the new Silver Age took root in the Bush/Cheney coup de etat, and its resulting catastrophes, beginning with 9/11, which defines the true beginning of the 21st Century. The shockwaves Americans endured for years to come, required the musical to return as a public balm. I hadn't any six degrees connection to 9/11 (tho my longtime friend Tim Witter passed under the Twin Towers in a cab mere minutes before the first plane hit--on way to Newark Airport), but weren't we all walking around like Zombies for some time afterwards? Bad enuf we had to endure the incompetence of Bush and the malevolence of Cheney, as we started down that long hell-hole, now a series of personal unfortunate events came my way which made these years the worst of my life. Three months after 9/11, my partner Greg (who was managing an office at a wellness clinic) was broadsided by a woman running a red light; car totaled, waking up in the ER. Remarkably he seemed to be fine, but over time certain complications emerged, leading to a seizure, and then in hospital the main event: a fall by their negligence that rendered him paralyzed for the next half year. After getting nowhere with Kaiser, Greg returned home to a newly setup hospital room, and thru our genius medical intuitive, Rhonda, slowly regained intelligence in his lower body and began to stand and barely walk. But that's another story...and a long one it is. The impact on me, was no picnic either. At first there was a rotating staff of nurses in the daytime (allowing me to go to work) and Greg's friends--tho they soon virtually all disappeared. My evenings had me playing cook, nurse, companion and morale booster; until he's tucked in to slumberland. It was like suddenly having a child--an infant at that, if you factor in the of changing diapers. My one sweet spot was the one or two late hours I had to myself, a puff of magic herb, and an escape into a musical album, or a movie--nothing was more soothing than a '40s Fox musical with Betty Grable, Alice Faye or Carmen Miranda, with glistening Technicolor backlot settings: Rio, Miami, Cuba, Canadian Rockies--fairly new to me (no compilation like MGM's That's Entertainment ever clued later generations to these forgotten goodies.) As much needed bon bons of escapism, I can well understand the popularity of such pulp during the Great War. For obvious reasons I can date the end of my social life--modest as it was--to early 2002. But what became evident as Greg healed--ever so slowly--was that I so treasured the few hours I had stolen to pursue my own explorations & creative works, that no matter how much I regained, 'twas never enuf. The first project to suffer was my musical, When Stars Collide for which I had embarked on revising as well as writing new lyrics to be set to music by Billy Philadelphia (who was likewise consumed by life and in no hurry). We managed to get six songs done the whole year--a couple of which were soon discarded. I hadn't time for my art/collage work either. I was blessed in one regard, however: my job was stable, unassuming and flexible to any and all of my needs. Yet approaching my 50th birthday I hadn't the morale or the wherewithal to plan for any grand gesture (as I had on my 40th, writing and performing my own monologue, The Nikita Khruschev Songbook). As it happened, my Father would've ruined any planned event, as he took deathly ill on the day itself, and was rushed to hospital, forcing me to deal with my distraught and near hysterical mother--in depressing San Jose. I suppose I could count as a birthday gift my father's apology--from his hospital bed--for being a lousy father. I took this to be indication of how close the end must be, rather than any heartfelt rapprochement. Mother on the other hand was refusing to even considerate his demise, going so far as to contradict Father's Do Not Resuscitate dictum, telling the staff to keep him alive at all cost. For this he suffered another invasive operation (colon cancer this time) returning home within a week. But by Xmas he was back in hospital with a new round of issues. He spent the holidays in an overcrowded nursing home, and I was making the hour's journey from SF with dreaded regularity, the start of my hatred of driving--not to mention the physical anxiety attacks. The only upside was that Greg was now autonomous enuf to afford my frequent absences. I soldiered on, but two nights before New Years, I managed to get myself to the Metreon to see Chicago. 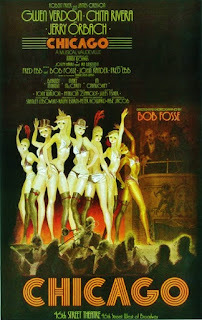 Despite outstanding advance word, it was a high bar indeed to measure up to Verdon, Rivera & Orbach and the fingerprints of Fosse, which made it all the more sweet that the film was so happily realized. I returned to corroborate my first impression the following Sunday. By this time Father was released home once more, and against all odds seemed to dodge the Grim Reaper for the umpteenth time, looking and feeling somewhat healthy once again--much to Mother's desperate relief. My own relief was measured for I knew it only put off the inevitable again. The truth was neither of them had any interest in being alive anymore--Father's age and maladies put his global wanderings finally to rest; and Mother was nothing if not incessantly frail, nervous, and miserable. Mired in their natural Russian pessimism, they nonetheless clung to life with genetic fortitude--annoying each other as only the most intimates can, locked in mutual co-dependence & resentment. For years Father had stated when the End Was Near he would graciously shoot her first & then himself. But in the end he was both selfish and a coward. He only shot himself. After a fortnight his renewed vigor was curdling again, and seeing the writing on the wall; facing a return to hospital, or worse, a nursing home--he shot himself in the head upstairs in his office, while Mother was downstairs washing dishes. But sparing her life was ultimately crueler and a good deal more painful for all concerned--especially Mother. The Old Man exhibited signs of dementia as well in the last few weeks; one key example being his sudden conviction that his mother, my Baba, was secretly Jewish--his evidence being, "Look at her!" This was primarily preposterous for Baba was staunchly proud of her heritage, and if she was Jewish she would have worn it like armour. This was also curious as Father had always been something of a covert anti-semite, only to "out" himself on his deathbed as a Jew? God only knows what karmic guilt trips he was untangling in his dying brain. In the end he was true to his Russian self. Putting gun to temple, much as his father had (having colluded with the Germans, on the losing end of the war)--a tradition I'm certain not to continue. (Suicide, who knows? Guns, never). Facing only pain and the prospect of failing organs, I can't say I blame him for his exit strategy. I only wish he took Mother with him. Believe me, she did too. Worst Omission: "Me & My Baby"
Standout Numbers: "Roxie" "All I Care About"